St. Francis Parish advances each year in its outreach to the poor, the homebound, and those in any kind of need. Training and education for Stephen Ministers are conducted at the parish. Regular and extraordinary food drives and fundraisers for the poor in our region and throughout the world, particularly in the Diocese of Kottappuram in India, successfully raised awareness among parishioners that human need knows no borders or bounds. Continuing education on the Church’s concern for the poor, the natural environment, and for the migrant fuel the drive of parishioners to seek justice both in theory and in deeds. Here are several volunteer service project ideas. Complete this survey to learn what is the right ministry for you. Coffee & Donuts Social Host Volunteers are needed for this ministry of hospitality on most Sunday mornings following the 8:45 am and 10:30 am Masses in the Parish Activity Center (PAC). In addition to fresh coffee and doughnuts we also have bagels, juice, and yogurt for those looking for a healthier snack. Interested? Please contact Marty Lucas at mlucas@stfrancisa2.org or 734-821-2125. Altar and Church Care Teams: You are welcome to join the many parishioners who support the Parish by caring for our altar area and church. The teams are responsible for light cleaning and organization. For more information contact our Liturgy Coordinator at liturgy@stfrancisa2.org or 734-821-2123. Funeral Luncheon Team: Volunteering at our Parish funerals is a wonderful way to help a fellow Parishioner at an important time. Volunteer opportunities range from donating a salad or dessert for the funeral luncheon to set-up and assisting during the luncheon. For more information contact our Liturgy Coordinator at liturgy@stfrancisa2.org or 734-821-2123. Wedding Coordinator: Helping as a Wedding Coordinator you will assist the bride and groom on their wedding day. For more information contact our Liturgy Coordinator at liturgy@stfrancisa2.org or 734-821-2123. St. Vincent Service Ministry, and, Volunteer service project opportunities in our community are available throughout the year. See our SignupGenius or Sign-Up Forms page for current volunteer options organized by St. Francis Parish St. Vincent Service Ministry. Events like: Assist at Emergency Food Program; Serve a Meal to the Hungry; Food Drives – Help Deliver Food; Shelter for People Who Are Homeless; Help With Tax Forms; Donate a Day in April; Charity Christmas Dinner Party, Christmas Giving Tree and Regift Box, Habitat House, Pro-Life Events, Hunger Walk, etc. Justice Advocacy : Educating, advocating, and building a just society, living lives of peace and holiness amidst the challenges of modern society. 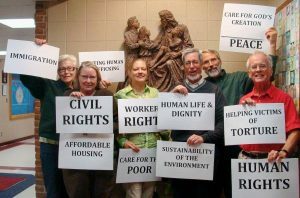 Social concerns relevant to Catholic Social Teaching include topics such as: the dignity of human life, human rights, care for the Earth and its resources, the preferential option for the poor and vulnerable, workers’ rights, and solidarity with all our human family. Jail & Prison Ministry – Jesus is in JAIL! Will you pray with Him? 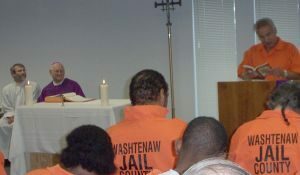 “Be Not Afraid!” Jesus was incarcerated during his life, and he can still be found in the jail. Come and see for yourself. Join a ministry team! 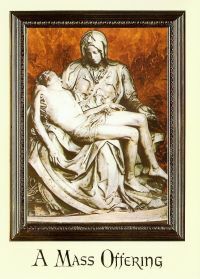 Prayer Ministry, Mass Cards and Intentions – Make your prayer requests & intentions known. We should never underestimate the power of prayer and the support that we are given knowing that others are praying for us. We invite you to share your prayer request with us. Remember, no one is alone in this world. We support one another in our prayer. Homebound Ministry brings the Eucharist to our parish members who are unable to join our community at Sunday Mass. Become a Homebound Minister. Elizabeth Ministry is temporary help with meals and help around the house during life-changing events. Stephen Ministry is a Christian confidential ministry. Stephen Ministers are lay members of our Parish who are specially trained to listen and stand with another going through a challenging time.